Denise Mina is proving to be a prolific crime novelist, depicting an interconnected group of characters in Glasgow over the last few decades. This novel features Detective Superintendent Alex Morrow trying to solve the shooting of an old man in a Post Office. 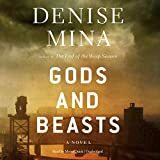 Gods and Beasts is an ambitious work, with a large cast of characters, including the police, local politicians, suspects, and it deals with corruption at different levels. The details of the city life, police work, and battles between local politicians are more gripping than the characters. This is not as gripping as Mina's earlier novels featuring the young woman journalist Paddy Meehan, but it presents a more complex portrait of a city. The mystery side of the work isn't particularly interesting, and some of the characters don't make a lot of sense, but the story does come to a satisfactory resolution. The performance of the unabridged audiobook by Moira Quirk keeps the Scottish pronunciation authentic and she brings energy to the story.